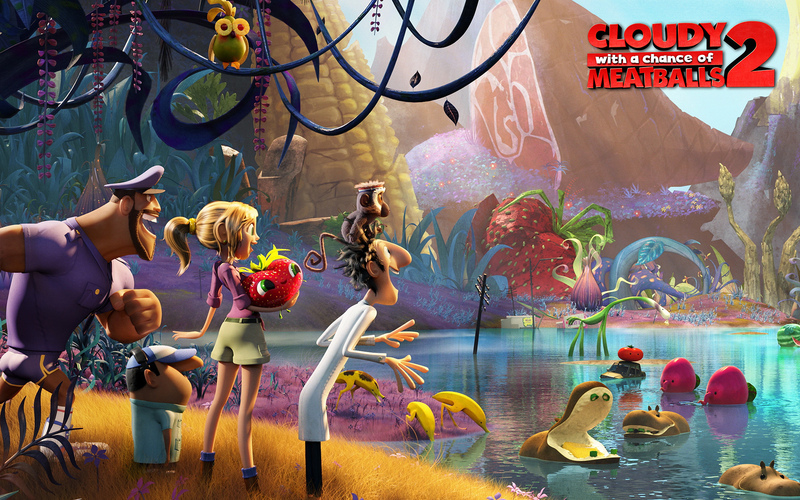 Cloudy with a Chance of Meatballs 2 is a whole lot of fun. Four years after the first film was released, this laugh out loud sequel picks up from where it left off. The same lovable characters return alongside Flint Lockwood, the naïve and excitable inventor. The last film showed us the Island of Swallow Falls covered in food. So in the sequel a clean-up operation begins, causing all of the island’s residents to evacuate. Flint meets his idol Chester V, who offers him a job in Live Corp, an invention corporation. Believing this will lead him to his big break, Flint starts his caffeine fuelled, highly competitive job with company. Chester V discovers that Flint’s food making machine is still churning out living food or foodimals. He orders Flint to travel to the island and destroy the device, saving the world from a foodimal invasion. Flint is joined by his father Tim Lockwood, love interest Sam Sparks, chicken Brent, Officer Devereaux, Manny and Steve the monkey, as he journeys to the island to carry out the task. Of course chaos ensues. Along the way the group encounters an adorable strawberry, a giant moving taco and an angry cheeseburger spider with fries for legs. All the talk of food throughout this film may leave you a bit peckish. Though it’s targeted for kids, big kids will love this film too. It’s even got subtle adult humour “she wants you to scratch her buns” (yes, it is an actual line from the film!) And of course there’s the uniquely named “BS USB” that is given to Finn to destroy his food making machine. Obviously any food related animated picture would need a million and one puns. This film is full of it. So if you have a particular dislike for cringy food puns, maybe this isn’t for you. It’s a wacky film that is guaranteed to make you laugh; you have to just go along with the silliness. It’s a sweet story too that touches on the themes of friendship, parental love and loyalty. However these themes could have been developed better. There’s the good guy versus bad guy feel which is an audience pleaser but not very original. It doesn’t drag on and ends at the 95 minute mark. Even if you didn’t see the first one it’s easy to follow as there’s a quick recap at the start of the film. Also the soundtrack is rather cool. It’s not expected to be as popular as its predecessor, which was a $243 million box office success worldwide. The group at Sony Pictures Animation can only hope that the sequel will piggy back on the first film’s success. It’s the characters’ personalities and the very cute foodimals that make this film so amusing. The feel good factor makes it worth the watch. Cloudy with a Chance of Meatballs 2 is released on 25th of October in Irish cinemas.